AOI's Sesquicentennial - The Association of the Oldest Inhabitants of D.C.
Mayor Anthony Williams speaks on the District's place in history and the strides the city has made in the past 15 years. The "Washington Post's" 'Answer Man' John Kelly chats with Theresa Saxton, Secretary of the Military Road School Preservation Trust. Sat., December 5, 2015. On the occasion of its 150th Anniversary, the AOI of DC – the District’s oldest civic organization, established December 7, 1865 -- hosted 125 of its members, friends, affiliates and honorees at a luncheon held at the Capitol Skyline Hotel in Southwest. “Our organization has been particularly fortunate to have made good investments over the years while at the same time supporting on-going initiatives of the District’s historic and heritage organizations. 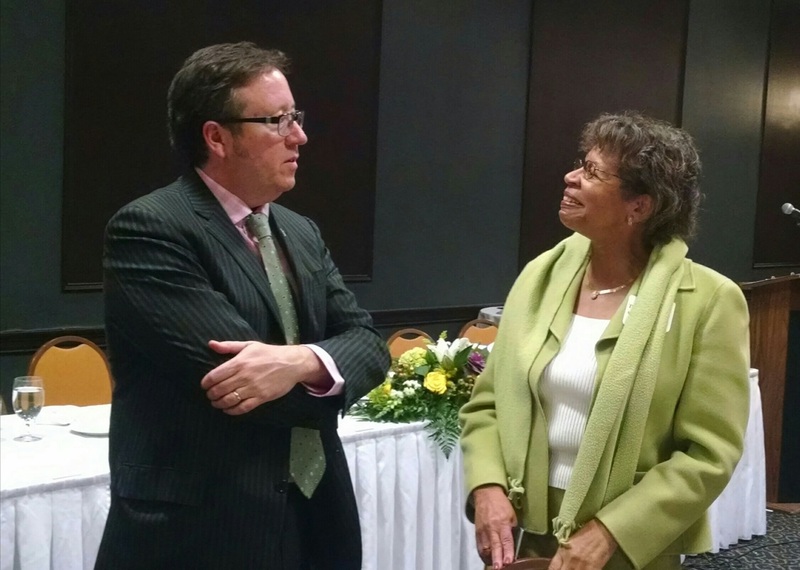 We felt it was time to pay forward the fruits of our fiscal good fortunes and disburse about one half of our holdings to organizations we know would benefit from this gift,” according to AOI President Bill Brown. The six organizations – the Military Road School Preservation Trust, the Friendship Fire Association Museum, the Heurich House Museum, the Historical Society of D.C., the Committee of 100 on the Federal City and the George Washington University School of Business’ Masters of Tourism Administration program – have all been held close by the AOI, each reflecting their own, unique contribution to the historic fabric of the District. The reception and luncheon featured music from the Levine School of Music, an audio-visual history of the organization, welcoming remarks by The Washington Post’s John Kelly and a keynote address by former Mayor Anthony Williams. 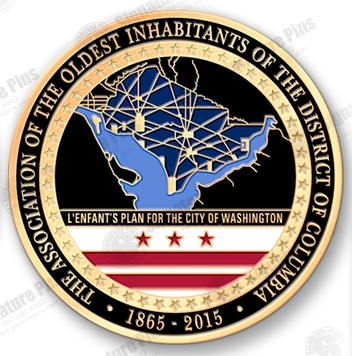 Every member and guest received a commemorative challenge coin based on the AOI’s logo on the obverse and a unique, stylized representation of Peter L’Enfant’s Plan for the City of Washington together with the District of Columbia flag on its reverse. A detailed written history of the organization by researcher/author Zach Klitzman accompanied the printed program. Washington Post columnist John Kelly who many long time readers know as the successor to Bob Levey, Bill Gold and other “chroniclers” of D.C. history (including past AOI President John Clagett Proctor who wrote the “Rambler” column for the Evening Star), welcomed those attending by highlighting ads and stories which appeared in The Post in 1880 covering the gamut from tonics and ointments to theater openings and social events. John noted that between 1877 and 1987 the AOI was mentioned 930 times in those 110 years. When the AOI awarded Mayor Tony Williams their first “Governor Shepherd Award for Civic Improvement in November 2006, little did the organization’s leadership foresee nine years ahead that the former Mayor and now CEO of the Federal City Council reflected on the strides the District has made in the past 15 years and keeping history in mind while planning for the future. The AOI’s Officers and Directors have worked for nearly two years to determine how best to celebrate the 150th anniversary of the organization. They had two goals for 2015 – their sesquicentennial year – one was to formally turn over to the Friendship Fire Association Museum (the official museum of DC Fire & EMS) a number of historic artifacts that the AOI had it its care since 1907. The organization became allied with the Fire Department when they welcomed the few remaining members of the Veteran Volunteer Firemens Association into their ranks to help preserve that organization’s history. When the Friendship Fire Association Museum was eventually opened to the public, the AOI – with approval from its membership -- determined that after 108 years, the four pieces of wheeled apparatus and two bronze fire bells were ready for display, proper curatorial treatment and conservation. The second goal for 2015 was to determine how best to recognize a handful of organizations (including the FFA Museum) that have been long-time members and supporters of the AOI or by their own nature share the civic and preservation goals of the AOI. The Board recommended, again with the consent of the membership, to disburse $25,000 to each of these six organizations for a total of $150,000 in keeping with the organization’s 150th anniversary. Representatives from each of the honored organizations were undoubtedly surprised when presented with their large, ceremonial checks and heard their AOI Board table hosts read the dedication to each. (The text of the individual tributes appears at the conclusion of this release). The first recipient and therefore probably the most taken aback was the Chairman of the Military Road School Preservation Trust R. Barbara Johnson who, exclaimed, “I can’t believe this!” Together with their Secretary Theresa Saxton, their members and friends appeared overwhelmed. Accepting for the five other organizations were: for the FFA Museum – Executive Director Walter Gold, Curator Mark Tennyson and President retired Fire Lieutenant James Embrey; for the Heurich House Museum – Executive Director Kimberly Bender and Kevin Stogner a foundation Trustee; for the Historical Society – Executive Director John Suau and Trustee Judy Hubbard; for the Committee of 100 – Chair Nancy MacWood and Secretary Meg Maguire; and, for the Masters of Tourism Administration Program of George Washington University’s School of Business – Dr. Larry Yu and Dr. Kristen Lamoreaux. Recently named to an associate deanship at NYU, Kristen was once Dr. Philip W. Ogilvie’s graduate assistant. Ogilvie was a Past-President of the AOI, former Archivist for the District and Professor of Tourism Studies at GWU and it is for him that an annual award is presented to the MTA student for highest academic achievement – The Philip W. Ogilvie Award. The Military Road School celebrated its sesquicentennial last year (2014) but the school’s history would not be told and its preservation would not have occurred had it not been for a number of alumni of the school’s Class of 1954 (the last year the school operated prior to desegregation). They stepped forward to ensure the school, its history, its relationship to the Civil War, the Battle of Ft. Stevens and its Brightwood neighborhood were documented and shared. With the assistance of Phil Ogilvie and many others from the historic preservation community, the MRSPT was successful in having their school designated a Historic Landmark even as it was being repurposed as a Charter School. But the members of the MRPST have gone beyond preserving the history of their alma mater, through their frequent reenactment programs they have not only brought that era of the Civil War and African-American life in Washington to life but they have mentored numerous young people and provided scholarships to many to proceed on to college. 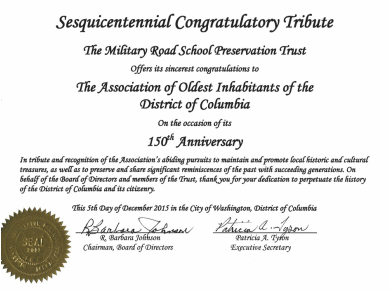 For their unique and continuous service to their neighborhood, their school, and the District’s African-American Civil War experience, the AOI is pleased to present its first Sesquicentennial Grants to the Military Road School Preservation Trust. Since the few remaining members of the Veteran Volunteer Firefighters became members of the AOI in 1907 (in part to preserve their collection of antique artifacts and retain control of the Union Fire House [granted them in 1890] as “…in a few more years there be none to represent them…” James Croggon wrote for The Evening Star on Oct. 14, 1911), the AOI has had a long, close, custodial relationship with the VVF and their successors. Today’s Friendship Fire Association and their volunteers are probably best known – at least by the firefighting community – for providing the Canteen Unit and the Rehab Unit for firefighters at working fires. But they are also known for collecting, conserving, protecting and displaying many of those historic artifacts, journals, log books, helmets and associated equipment that represent the District’s 150+ year history of a paid fire department and that of the volunteers who preceded them. With this in mind, the AOI is pleased to present one of its Sesquicentennial Grants to the Friendship Fire Association’s DC Fire & EMS Museum for conservation, preservation and education. Long-time AOI members know the intimate relationship between the AOI and the Heurich House. Not only was Christian Heurich an early member of our organization, but when his window Carla donated their house to the Columbia Historical Society for its headquarters in 1954, the AOI soon after became a virtual occupant considering 1307 New Hampshire Avenue its headquarters (mail stop, meeting place, etc.) when the World Bank purchased the Old Union Firehouse from us in 1956. Over the ensuing years, while the AOI never truly occupied space in the Heurich House, our dedication and support was such that by 1991 the AOI had provided the proceeds from both the sale of the fire house and a $15,000 bequest from the estate of Theodore Noyes and then some as challenge grants to add the elevator lobby, replace the roof, and establish a library endowment among other initiatives. Today, as the city’s only intact late Victorian mansion and house museum, the AOI recognizes the Heurich family descendants, numerous volunteers and supporters, board of directors and staff with one of its Sesquicentennial Grants to the Heurich House Museum. When it comes to the preservation of Washington history, few have been as successful, accomplished or as generous as the late Austin Kiplinger and the Kiplinger Foundation has been to the Historical Society of Washington and its excellent research library. Authors, researchers, film makers, genealogists and reporters have relied on the holdings of the Kiplinger Research Library and its archives for their work. Several benefactors have given their collections of Washington history (papers, broadsides, photographs, sketches and paintings) to several institutions but we believe it can be said that none have done so with the love of history, enthusiasm and verve that Austin Kiplinger has shown. The AOI is pleased to present one of its Sesquicentennial Grants to the Historical Society of Washington D.C.’s Kiplinger Research Library to support its Adopt-a-Class educational initiatives: “Third Grade Historians” and “Who’s a Washingtonian?” a program for 12th graders. We can say with certainty there is no other organization in the city that more nearly represents the preservation interests shared with the AOI than the Committee of 100. Whether it was standing up to preserve the Old Post Office, staunchly supporting maintaining the city’s historic height limits, speaking on behalf of the National Mall, the Civil War Circle Fort Parks, monitoring the development plans for St. Elizabeth’s, Walter Reed, Union Station and the McMillan Reservoir, no other organization has the clout, name recognition, power-house membership or success than the Committee of 100. Realizing that the Committee of 100 will continue to be at the forefront of preservation and planning battles for decades to come, the AOI is pleased to present one of its Sesquicentennial Grants to the Committee of 100’s L’Enfant Trust. Many AOI members are aware of the legacy that Dr. Philip W. Ogilvie left our organization, the D.C. city archives and know that AOI presents an annual cash award to the valedictorian of the George Washington University’s Master of Tourism Administration program. Our donation to this program, now in its 14th year, was named for Phil Ogilvie as he was an Adjunct Professor of Tourism Studies until his untimely death in 2003. The AOI has chosen to single out and recognize this program not only due to its success but in that tourism (other than the Federal Government and our university ‘industry’) is in many ways the District’s livelihood. See a copy of the Gala Program here. Read Zach Klitzman's recently written history of the AOI here. 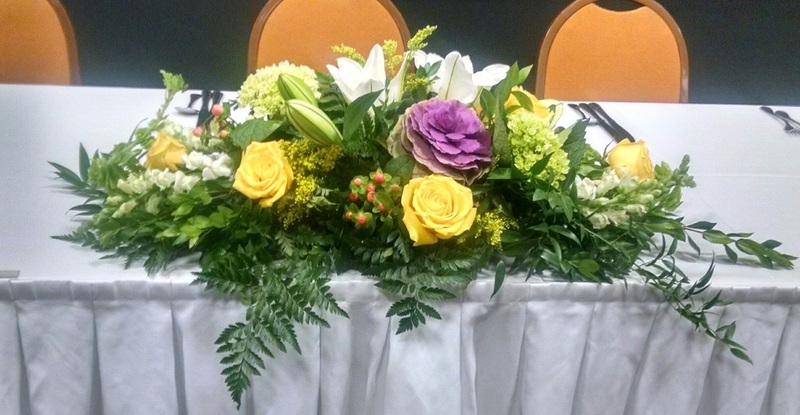 The centerpieces, each one unique, were designed by Johnson's Flower Center. You can listen to the audio of the Gala program here. Note: the AOI History segment (YouTube above) has been deleted in this audio version. ​The staff of the Capitol Skyline Hotel including General Manager Jeff Ragonese, Director of Association and Corporate Accounts Chris Benner, Executive Chef John Schumacher and their staff. Music provided by Levin Music's Ralitza Patcheva. Johnson's Flowers for underwriting the cost of our centerpieces. ​For our invitations and programs design Carrie Missaggia of Vocal I Design and GRC for printing. ​Aaron Levine was the recording technician for the AOI AV History Presentation, Anthony Washington was our photographer and Peter Swinburne was our videographer. 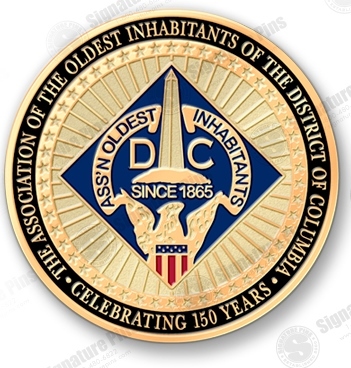 Our sesquicentennial challenge coin was developed and designed by signaturepins.com. ​Please patronize these organizations and individuals who supported our gala.